Any Custom Made machine can be built and would require a special quote. Call us if you have special needs! Trigger Gun control and wand assembly with insulated grip and quick connects. Shipping dimensions 48" x 40" x 54"
* Sorry, no free freight to Texas & California. Please call 866-858-4982 for rates. This item requires California sales tax to be added to California deliveries. 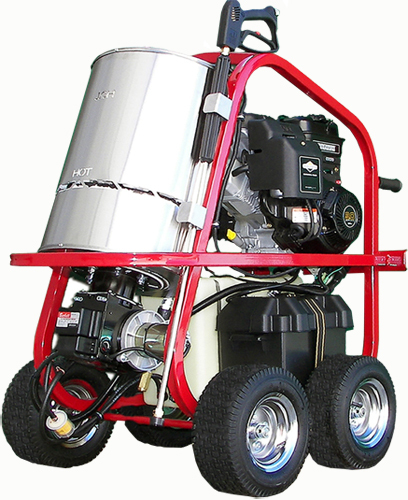 The SK Series is a highly portable machine ideal for use where electric power is not available. Unit can be trailer / truck mounted or add optional wheel kit for maximum portability! These are optional wheel kits for hot water pressure washer on the go SK Series. Failure to maintain heat exchanger coil may result in a system explosion which may cause serious injury or death. Hard water conditions may eventually cause clogging in the heat exchanger coil if left unattended. Scale deposits will compromise the heating efficiency and produce an unsafe condition over time. It may be necessary to de-scale coil. Scale buildup from certain detergents may eventually clog up the heat exchanger coil causing an unsafe condition. Use recommended detergents for better cleaning efficiency. Black carbon deposits that collect on the outside wall of the heat exchanger coil may be a result of using a poor grade of fuel or improper burner operation. Heating fuel should be void of water and sediments to eliminate the possibility of soothing and compromising the efficiency of the coil. We recommend that you call your local distributor to have the unit de-scaled. Storage: Protect machine from freezing temperatures by storing in heated area. Winterizing the float tank machines: Pour antifreeze into float tank and remove water nozzle from end of wand and carefully insert wand into opening of float tank. Start machine and run until anti-freeze water mixture has circulated throughout the machine returning back to the float tank. Direct Drive Machines: To protect the machine from freezing temperatures while storing or transporting, connect short length of garden hose (approximately 3ft.) to water inlet connection on machine. Remove the pressure nozzle from the wand and insert the short garden hose end into a container of antifreeze. Place the wand into the antifreeze container and start engine running machine until antifreeze appears from the end of the wand. Turn engine "OFF" and replace pressure nozzle. Coil up hose and move machine to storage area. 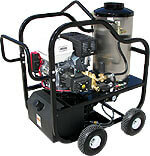 BV Series- 2000PSI-3000PSI The BV gas-fired hot water pressure washers provide high performance with modular design. These machines are ideal for industrial and commercial cleaning applications. They are available in either NG or LP configuration to allow you to accommodate your individual needs. Need a diesel powered hot water pressure washer? These series of portable or stationary units will match all of your need. Assembled and tested in the USA. Need a Water Containment System? The Vacu-Boom system is engineered to be used in a wide variety of industrial and commercial applications where chemicals and fluid waste must be contained and/or captured and removed from the site. Comes in different sizes and it is lightweight, can withstand the temperature up to 300 degrees.